Hao K, Takahashi J, Sakata Y, Miyata S, Shiroto T, Nochioka K, Miura M, Oikawa T, Abe R, Sato M, Kasahara S, Aoyanagi H, Shimokawa H; the CHART-2 Investigators. Prognostic impact of residual stenosis after percutaneous coronary intervention in patients with ischemic heart failure -A report from the CHART-2 study- Int J Cardiol. 278:22-27,2019. Kojima S, Ogawa H, Kimura K, Takayama M, Sumiyoshi T, Yasuda S, Takahashi J, Shimokawa H, Nishihira K, Nakao YM, Honda S, Takegami M. Nationwide real-world database of 20,462 patients enrolled in the Japanese Acute Myocardial Infarction Registry (JAMIR): impact of emergency coronary intervention in a super-aging population. IJC Heart & Vasculature. 20:1-6,2018. Beltrame J, Crea F, Kaski JC, Ogawa H, Ong P, Sechtem U, Shimokawa H, Merz CNB; COVADIS Group. International standardization of diagnostic criteria for vasospastic angina. Eur Heart J. doi:10.1093/eurheartj/ehv351. 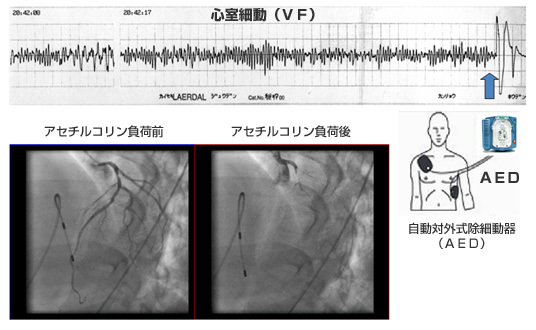 Nihei T, Yamamoto Y, Kudo S, Hanawa K, Hasebe Y, Takagi Y, Minatoya Y, Sugi M, Shimokawa H. Impact of the intracoronary Rendezvous technique on coronary angioplasty for chronic total occlusion. Cardiovasc Interv Ther. 32:365-373,2017. Ridker PM, Everett BM, Thuren T, MacFadyen JG, Chang WH, Ballantyne C, Fonseca F, Nicolau J, Koenig W, Anker SD, Kastelein JJP, Cornel JH, Pais P, Pella D, Genest J, Cifkova R, Lorenzatti A, Forster T, Kobalava Z, Vida-Simiti L, Flather M, Shimokawa H, Ogawa H, Dellborg M, Rossi PRF, Troquay RPT, Libby P, M, Glynn RJ; the CANTOS Trial Group. Anti-Inflammatory therapy with canakinumab for atherosclerotic disease. New Engl J Med. 377:1119-1131,2017. Merz CN, Beltrame J, Camici P, Crea F, Kaski JC, Ogawa H, Peter P, Sechtem U, Shimokawa H. A shocking development in a young male athlete with chest pain (Letter to the Editor). Circulation. 133:756-763,2016. Suda A, Namiuchi S, Kawaguchi T, Nihei T, Takii T, Saji K, Sugie T, Kato A, Shimokawa H. A simple and rapid method for identification of lesions at high risk for the no-reflow phenomenon immediately before elective coronary stent implantation. Heart Vessels. 31:1904-1914,2016. Tsuburaya R, Takahashi J, Nakamura A, Nozaki E, Sugi M, Yamamoto Y, Hiramoto T, Horiguchi S, Inoue K, Goto T, Kato A, Shinozaki T, Ishida E, Miyata S, Yasuda S, Shimokawa H; the NOVEL Investigators. Beneficial effects of long-acting nifedipine on coronary vasomotion abnormalities after drug-eluting stent implantation. -The NOVEL Study- Eur Heart J. 37:2713-2721,2016. Takahashi J, Nihei T, Takagi Y, Miyata S, Odaka Y, Tsunoda R, Seki A, Sumiyoshi T, Matsui M, Goto T, Tanabe Y, Sueda S, Momomura S, Yasuda S, Ogawa H, Shimokawa H, on behalf of the Japanese Coronary Spasm Association. Prognostic impact of chronic nitrate therapy in patients with vasospastic angina -Multicenter registry study of the Japanese Coronary Spasm Association- Eur Heart J. 36:228-237,2015. 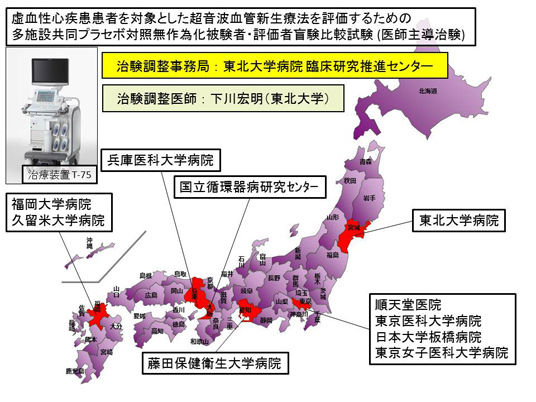 Hao K, Takahashi J, Ito K, Miyata S, Sakata Y, Nihei T, Tsuburaya R, Shiroto T, Ito Y, Matsumoto Y, Nakayama M, Yasuda S, Shimokawa H. Emergency care of acute myocardial infarction and the Great East Japan Earthquake Disaster -Report From the Miyagi AMI Registry Study- Circ J. 78:634-643,2014. Sakata Y, Shimokawa H. Ischemic heart disease. In: Wakabayashi I, Groschner K (eds), Interdisciplinary Concepts of Cardiovascular Health. pp.1-17. Springer, Wien, Austria. 2014. Ichihara S, Yamamoto K, Asano H, Nakatochi M, Sukegawa M, Ichihara G, Izawa H, Hirashiki A, Takatsu F, Umeda H, Iwase M, Inagaki H, Hirayama H, Sone T, Nishigaki K, Minatoguchi S, Cho MC, Jang Y, Kim HS, Park JE, Tada-Oikawa S, Kitajima H, Matsubara T, Sunagawa K, Shimokawa H, Kimura A, Lee JY, Murohara T, Inoue I, Yokota M. Identification of a glutamic acid repeat polymorphism of ALMS1 as a novel genetic risk marker for early-onset myocardial infarction by genome-wide linkage analysis. Circulation: Cardiovascular Genetics. 6:569-578,2013. Kawana A, Takahashi J, Takagi Y, Yasuda S, Sakata Y, Tsunoda R, Ogata Y, Seki A, Sumiyoshi T, Matsui M, Goto T, Tanabe Y, Sueda S, Kubo N, Momomura S, Ogawa H, Shimokawa H. Gender differences in clinical characteristics and outcomes of patients with vasospastic angina -A report from the Japanese Coronary Spasm Association- Circ J. 77:1267-1274,2013. Sakata Y, Shimokawa H. Saturated fatty acid intake and cardiovascular risk. Eur Heart J. 34:1178-1180,2013. Takagi Y, Takahashi J, Yasuda S, Miyata S, Tsunoda R, Ogata Y, Seki A, Sumiyoshi T, Matsui M, Goto T, Tanabe Y, Sueda S, Sato T, Ogawa S, Kubo N, Momomura S, Ogawa H, Shimokawa H, on Behalf of the Japanese Coronary Spasm Association. Prognostic stratification of patients with vasospastic angina - A comprehensive clinical risk score developed by the Japanese Coronary Spasm Association - J Am Coll Cardiol. 62:1144-1153,2013. Takagi Y, Yasuda S, Takahashi J, Tsunoda R, Ogata Y, Seki A, Sumiyoshi T, Matsui M, Goto T, Tanabe Y, Sueda S, Sato T, Ogawa S, Kubo N, Momomura S, Ogawa H, Shimokawa H. Clinical implications of provocation tests for coronary artery spasm: safety, arrhythmic complications and prognostic impact -Multicenter registry study of the Japanese Coronary Spasm Association- Eur Heart J. 34:258-267,2013. Yasuda S, Shimokawa H. The Pathogenesis of Vasospastic Angina. In: Kaski JC, Eslick GD, Bairey Merz CN (eds. ), Chest Pain with Normal Coronary Arteries, pp.91-99. Springer-Verlag, London, UK, 2013. Hao K, Yasuda S, Takii T, Ito Y, Takahashi J, Ito K, Nakayama M, Shiba N, Fukumoto Y, Shimokawa H. Urbanization, life-style changes and incidence and in-hospital mortality from acute myocardial infarction in Japan -Report from the MIYAGI-AMI Registry- Circ J. 76:1136-1144,2012. Nihei T, Takahashi J, Kikuchi Y, Takagi Y, Hao K, Tsuburaya R, Shiroto T, Ito Y, Matsumoto Y, Nakayama M, Ito K, Yasuda S, Shimokawa H. Enhanced Rho-kinase activity in patients with vasospastic angina after the Great East Japan Earthquake. Circ J. 76:2892-2894,2012. Satoh K, Fukumoto Y, Nakano M, Kagaya Y, Shimokawa H. Emergence of the erythropoietin/erythropoietin receptor system as a novel cardiovascular therapeutic target. J Cardiovasc Pharmacol. 58:570-574,2012. 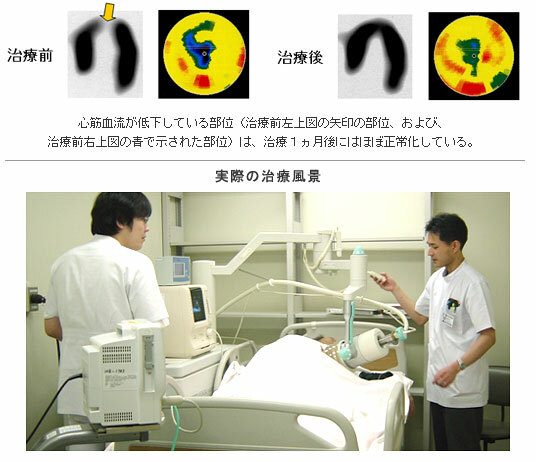 Serizawa F, Ito K, Kawamura K, Tsuchida K, Hamada Y, Zukeran T, Shimizu T, Akamatsu D, Hashimoto M, Goto H, Watanabe T, Sato A, Shimokawa H, Satomi S. Extracorporeal shock wave therapy ameliorates walking ability of patients with peripheral artery disease and intermittent claudication. Circ J. 76:1486-1493,2012. Takeda M, Shiba N, Takahashi J, Shimokawa H. A case report of very late stent thrombosis with peri-stent coronary artery aneurysm and stent-related coronary vasospasm: Insight to the mechanisms of sirolimus-eluting stent failure. Cardiovass Interven Therapeutics. 28:272-278,2013. Nakayama M, Osaki S, Shimokawa H. Validation of the mortality risk stratification models for cardiovascular disease. Am J Cardiol. 108:391-396,2011. Takagi Y, Yasuda S, Tsunoda R, Ogata Y, Seki A, Sumiyoshi T, Matsui M, Goto T, Tanabe Y, Sueda S, Sato T, Ogawa S, Kubo N, Momomura S, Ogawa H, Shimokawa H. Clinical characteristics and long-term prognosis of vasospastic angina patients who survived out-of-hospital cardiac arrest. -Multicenter registry study of the Japanese Coronary Spasm Association- Circulation Arrhythmia & Electrophysiology. 4:295-302,2011. Ito K, Kagaya Y, Shimokawa H. Thyroid hormone and chronically unloaded hearts. Vasc Pharmacol. 52:138-141,2010. Ito Y, Ito K, Shiroto T, Tsuburaya R, Yi GJ, Takeda M, Fukumoto Y, Yasuda S, Shimokawa H. Cardiac shock wave therapy ameliorates left ventricular remodeling after myocardial ischemia-reperfusion injury in pigs in vivo. Coron Artery Dis. 21:304-311,2010. Shimokawa H, Ito K. Extracorporeal cardiac shock wave therapy for ischemic heart disease. In: Achim M. Loske (ed. ), New Trends in Shock Wave Applications to Medicine and Biotechnology, Research Signpost, India, 211-224,2010. Takagi Y, Sugi M, Hanawa K, Shimokawa H. Successful recanalization of chronic total occlusion using retrograde approach in a patient with acute coronary syndrome due to aortosaphenous vein graft occlusion. JC Cases. 1:e112-115,2010. Yasuda S, Shimokawa H. Potential usefulness of fish oil in the primary prevention of acute coronary syndrome. Eur Heart J. 31:15-16,2010. Takagi Y, Yasuda S, Takahashi J, Takeda M, Nakayama M, Ito K, Hirose M, Wakayama Y, Fukuda K, Shimokawa H. Importance of dual induction tests for coronary vasospasm and ventricular fibrillation in patients surviving out-of-hospital cardiac arrest. Circ J. 73:767-769,2009. Yasuda S, Shimokawa H. Acute myocardial infarction: the enduring challenge for cardiac protection and survival. Circ J. 73:2000-2008,2009. Fukumoto Y, Yasuda S, Ito A, Shimokawa H. Prognostic effects of benidipine in patients with vasospastic angina:comparison with diltiazem and amlodipine. J Cardiovasc Pharmacol. 51:253-257,2008. Kokusho Y, Komaru T, Takeda S, Takahashi K, Koshida R, Shirato K, Shimokawa H. Hydrogen peroxide derived from beating heart mediates coronary microvascular dilation during tachycardia. Arterioscler Thromb Vasc Biol. 27:1057-1063,2008. 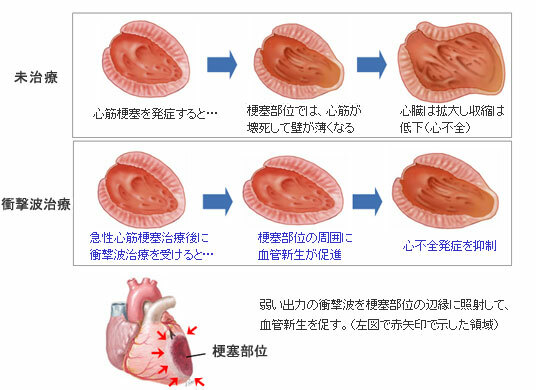 Shimokawa H, Ito K, Fukumoto Y, Yasuda S. Extracorporeal cardiac shock wave therapy for ischemic heart disease. Shock Waves 17:449-455,2008. Shimokawa H, Yasuda S. Myocardial ischemia: Current concepts and future perspectives. J Cardiol. 52:67-78,2008. Tada T, Nawata J, Wang H, Onoue N, Zhulanqiqige D, Ito K, Sugimura K, Fukumoto Y, Shimokawa H. Enhanced pulsatile pressure accelerates vascular smooth muscle migration: implications for atherogenesis of hypertension.Cardiovasc Res. 17:449-455,2008. Asaumi Y, Kagaya Y, Takeda M, Yamaguchi N, Tada H, Ito K, Ohta J, Shiroto T, Shirato K, Minegishi N, Shimokawa H. Protective role of endogenous erythropoietin system in nonhematopoietic cells against pressure overload-induced left ventricular dysfunction in mice. Circulation. 115:2022-2032,2007. Minatoya Y, Ito K, Kagaya Y, Asaumi Y, Takeda M, Nakayama M, Takahashi J, Iguchi A, Shirato K, Shimokawa H. Depressed contractile reserve and impaired calcium handling of cardiac myocytes from chronically unloaded hearts are ameliorated with the administration of physiological treatment dose of T3 in rats. Acta Physiol (Oxf). 189:221-231,2007. Satoh K, Kagaya Y, Nakano M, Ito Y, Ohta J, Tada H, Karibe A, Minegishi N, Suzuki N, Yamamoto M, Ono M, Watanabe J, Shirato K, Ishii N, Sugamura K, Shimokawa H. Important role of endogenous erythropoietin system in recruitment of endothelial progenitor cells in hypoxia-induced pulmonary hypertension in mice. Circulation. 113:1442-1450,2006. Tada H, Kagaya Y, Takeda M, Ohta J, Asaumi Y, Satoh K, Ito K, Karibe A, Shirato K, Minegishi N, Shimokawa H. Endogenous erythropoietin system in non-hematopoietic lineage cells plays a protective role in myocardial ischemia/reperfusion. Cardiovasc Res. 71:466-477,2006. Namiuchi S, Kagaya Y, Ohta J, Shiba N, Sugi M, Oikawa M, Kunii H, Yamao H, Komatsu N, Yui M, Tada H, Sakuma M, Watanabe J, Ichihara T, Shirato K. High serum erythropoietin level is associated with smaller infarct size in patients with acute myocardial infarction who undergo successful primary percutaneous coronary intervention. J Am Coll Cardiol. 45:1406-1412,2005.